19 The Green01263 715779work01603 870304fax Self-cateringTastefully refurbished by the current owners, 19 The Green, is an attractive, light and spacious cottage that offers good accommodation for families or friends holidaying together. There are bathroom and bedroom facilities on both floors of the cottage and French doors lead out onto a walled courtyard garden with barbecue. Upton is set in the heart of The Broads and is next to Upton Nature Reserve, which is home to some of Norfolk's rarest wildlife: from iconic swallowtail butterflies and Norfolk hawker dragonflies, to otters and water voles, and a staggering array of wetland plants. Upton is also not far from the east coast, which hosts some beautiful sandy beaches for fun days out. Upton Staithe is the ideal spot for fisherman and there is a boatyard who offer skippered taster sailing sessions should you wish to explore the area afloat. Other attractions in the locality include the Strumpshaw Hall Steam Museum, the Norfolk Rare Breeds Centre and Pettits Animal Adventure Park. For more cultural pursuits Norwich is less than half an hour's drive away and has numerous shops, restaurants, theatres and a castle to discover. There is plenty to entertain in this part of east Norfolk that will make for an interesting and memorable holiday. 19 The Green offers weekly bookings starting on Saturday. Tastefully refurbished by the current owners, 19 The Green, is an attractive, light and spacious cottage that offers good accommodation for families or friends holidaying together. There are bathroom and bedroom facilities on both floors of the cottage and French doors lead out onto a walled courtyard garden with barbecue. Upton is set in the heart of The Broads and is next to Upton Nature Reserve, which is home to some of Norfolk's rarest wildlife: from iconic swallowtail butterflies and Norfolk hawker dragonflies, to otters and water voles, and a staggering array of wetland plants. Upton is also not far from the east coast, which hosts some beautiful sandy beaches for fun days out. Upton Staithe is the ideal spot for fisherman and there is a boatyard who offer skippered taster sailing sessions should you wish to explore the area afloat. Other attractions in the locality include the Strumpshaw Hall Steam Museum, the Norfolk Rare Breeds Centre and Pettits Animal Adventure Park. For more cultural pursuits Norwich is less than half an hour's drive away and has numerous shops, restaurants, theatres and a castle to discover. 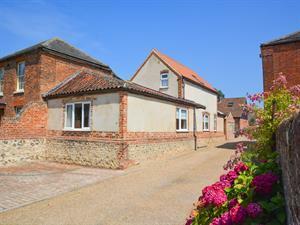 There is plenty to entertain in this part of east Norfolk that will make for an interesting and memorable holiday.